We’d planned to eat at The Boathouse, a newly renovated pub/restaurant on the river at the bottom of Saltaire village. It’s a slick and modern looking place which inexplicably stops serving food at 8pm despite having a large dining room, doesn’t run a reservations system and was packed by the time we arrived. It soon became obvious that Plan A had failed and there wasn’t a Plan B, so we wandered up to The Old Tramshed on the roundabout. 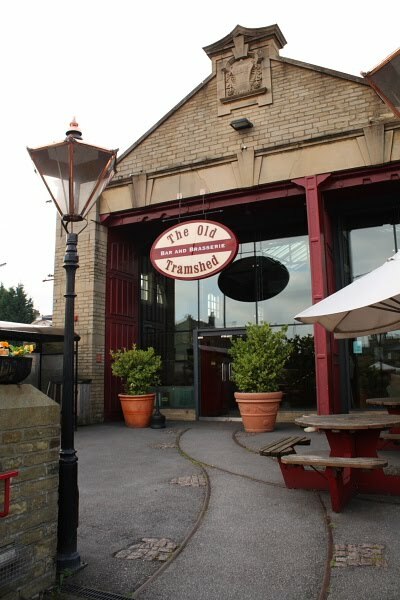 When The Old Tramshed opened a few years ago, it caused quite a stir as the first bar/brasserie in the area. It’s housed in a converted engine shed fronted with enormous glass windows and a smart restaurant on a mezzanine floor above a bustling bar. The food was aspirational and the building spectacular. Over the years, the place has changed hands and approach a few times, including a stint hosting variety type live acts which caused the average age of the clientele to rocket upwards at a shocking pace. It was all a bit rubbish, quite frankly. There was also a Sunday night singles event, which I don’t want to think about too much. The building is still just as impressive, but the current owners have taken a more relaxed approach. The entertainment side is more, well, entertaining, more acoustic rock and folk than aging variety acts and the restaurant feels less stuffy and formal than it used to. We sat upstairs on the mezzanine, and ordered something to drink. I asked about beers, and the waitress stumbled through three or four mass produced lagers and a couple of ciders before she mentioned anything remotely resembling a proper beer. I ordered Leeds Brewery’s Pale, which later turned out to have been Saltaire Brewery’s Pale Ale. It was very good, but slightly mis-sold. The menu was standard pub fare, a world away from the food that used to be served here. That’s not a bad thing – previous menus were over ambitious and sometimes missed the mark completely. Now, there are plenty of simple and unfussy dishes, the sort of things that people actually want to eat rather than the sort of food they think they do. Prices are ridiculously cheap. Jen’s steak was cooked well. She asked for medium, and she got medium, which hardly ever happens. Garlic mushrooms and proper chips on the side, a thick, rich, garlicky sauce to accompany. Not complicated cooking, but done well. 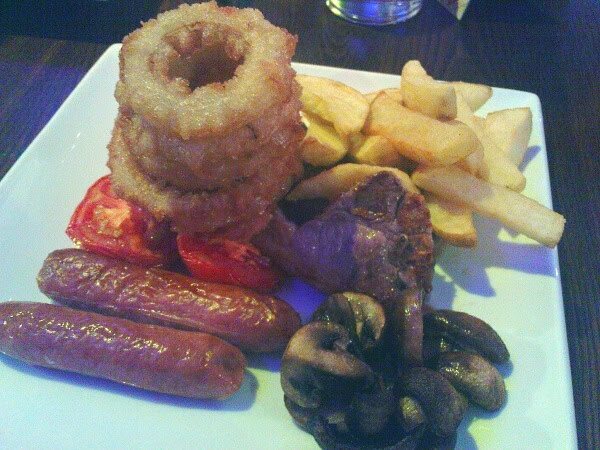 My mixed grill was less successful. There was nothing wrong with it, but it just proved a little too much for me. A lamb chop was left just pink and perfectly cooked, as was a piece of steak. The chips were excellent, hand-cut, crisp and light – very good chips indeed. The glorious chips were overshadowed by a huge stack of onion rings that were crisp, but oily, and a couple of sausages, which should have been better quality. Is there any excuse for serving a sub-standard sausage with two excellent butchers within a two minute walk? The menu also includes a series of tapas-like platters of small dishes of chorizo, chicken wings, and the like. They’re very successful. I’m a little torn by The Old Tramshed. It’s a great bar, and they’ve always had at least a couple of great beers on tap every time I’ve been, but the food lets it down. It’s fine, there’s nothing wrong with it as such, and it’s certainly good value, but it just isn’t memorable or adventurous. Our meal was accompanied by a selection of some of the most terrible music I’ve ever heard in public, anywhere. Not one track was recorded later than 1989, and there’s really no excuse whatsoever for playing Ray Parker Jr’s Ghostbusters at all, especially when I’m trying to eat. No chance of getting in at Don't Tell Sir Titus instead I suppose? I agree that The Old Tramshed is a funny place. It's such a great building inside and when busy has a good atmosphere – we've had a few good evenings in there including a memorable St Patrick's night in 2006. However, 3 years later on the same weekend and the place was dead. The ongoing change in management just confuses customers as each regime brings something different which is not to everyone's taste and they lose a segment of their customers. The recession clearly hits places like this hard plus when a new boozer comes along everyone flocks there instead (e.g. The Boathouse). The bar downstairs at Don't Tell Titus… was packed, but the restaurant upstairs was empty. We've eaten there in an empty restaurant before.